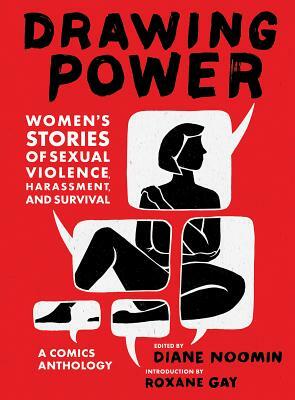 Inspired by the global #MeToo Movement, Drawing Power: Women’s Stories of Sexual Violence, Harassment, and Survival is a collection of original, nonfiction comics drawn by more than 60 female cartoonists from around the world. Featuring such noted creators as Emil Ferris, Aline Kominsky-Crumb, MariNaomi, Liana Finck, and Ebony Flowers the anthology’s contributors comprise a diverse group of many ages, sexual orientations, and races—and their personal stories convey the wide spectrum of sexual harassment and abuse that is still all too commonplace. With a percentage of profits going to RAINN, Drawing Power is an anthology that stokes the fires of progressive social upheaval, in the fight for a better, safer world. Diane Noomin is the creator of the comics character DiDi Glitz, editor of the Twisted Sisters anthologies, and was one of the early contributors to Wimmen’s Comix. She has been nominated for Harvey and Eisner Awards and received an Inkpot Award. Glitz-2-Go, a collection of Noomin’s art throughout her career, was published in 2013. Her work is included in the Library of Congress Print & Photographs collection. She lives in Connecticut. Roxane Gay is the New York Times bestselling author of Bad Feminist and Hunger. "Reading these stories together is like hearing a thousand feet stomping in unison or looking at the sea or the earth from far enough away to see its curve. This is a human problem that can neither be denied nor represented through a single story. I feel horrified, sad, tender, and proud, and most of all I want us to do better."